Today we will feature a must download app for your Chrome browser and Chromebooks or any device that is running Chrome OS as well. If you wanted an app that can compress, record and convert videos. Clipchamp is probably the app you have been looking for. Trust me on this, so let me explain. Clipchamp is an all-in-one video converter, video compressor, webcam video recorder and video uploader solution. 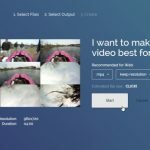 Upload videos to YouTube, Vimeo or Facebook up to 20x faster or just save them to your computer or Google Drive, you decide. Protects your privacy by processing your videos on your computer, not online. HTML5 video recorder, no Flash involved. Lets you record a video with your webcam in 360p, 480p and 720p. Max. length per video is 5 minutes. Is a reliable MP4 converter, also converts to WebM, WMV, FLV and GIF. Saves videos to your Google Drive. 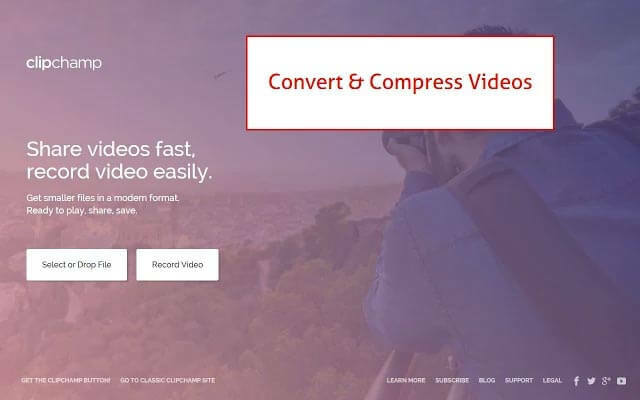 Achieves faster YouTube, Vimeo & Facebook uploads by compressing your videos into smaller sizes before the upload at no visible quality difference. Converts videos to WMV, handy to get them to work in Powerpoint and other Microsoft applications. Converts videos for playback on popular devices like smartphones, tablets, Chromebooks and Windows PCs. Works on Mac, Windows, Linux, Chrome OS. Supports a wide range of input formats such as MOV, AVI, MP4, FLV, DIVX, MKV, WMV, MPEG, MPEG4, M4V, ISO, 3GP and many others. The Clipchamp video converter works directly on your computer using Chrome’s cutting-edge capabilities. This means that it converts video files in your browser yet directly on your computer. There is no uploading or downloading of files involved.